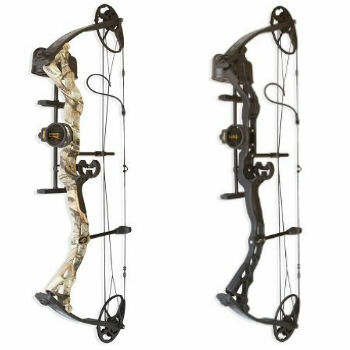 With so many hunting bows on the market, it can be difficult to determine which one is the best hunting bow for your needs. From different manufacturers and features to cheap hunting bows or those with a price tag that resemble a house payment, hunting season could be over by the time you finally find the best hunting bow for your budget. To make things much easier, we have compiled a list of the 8 compound bows that are perfect for new hunters. Take a look and determine which one is right for you. Made by Diamond and measuring 31” from one axle to the other, the camouflage Infinity Edge allows archers to adjust the draw length from 13” to 30” and the draw weight from 5 pounds to 70 pounds. 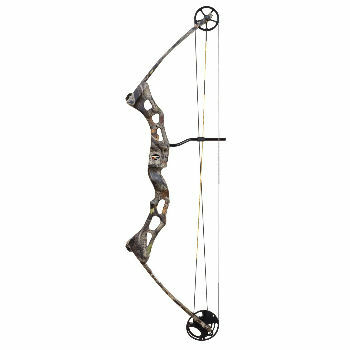 This makes it a great bargain and an ideal bow for right handed beginners because they can adjust it as their skills develop. It weighs only 3.1 pounds, making it easy to carry through the woods, yet arrows launch at a speed of up to 310 FPS, which ensure your target is effectively hit. 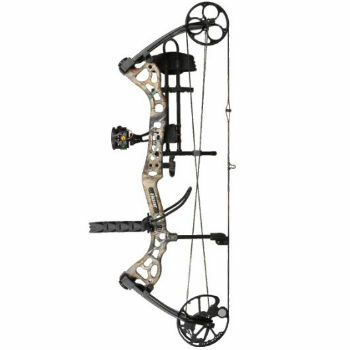 With a recommended list price of $349.99, the Infinity Edge includes a 3 Pin Apex Sight, Octane Deadlock Lite Quiver, arrow rest, arrow stop, and peep sight. Users rave about the Infinity Edge with comments frequently including “can’t believe what a good deal”, “accurate, easy to use, and it grows with you.” Learn more about why the Diamond Infinite Edge is one of the best selling bows on the market. There’s only one difference between the Diamond Infinite Edge Ops Rh hunting bow vs the Diamond Infinite Edge above. 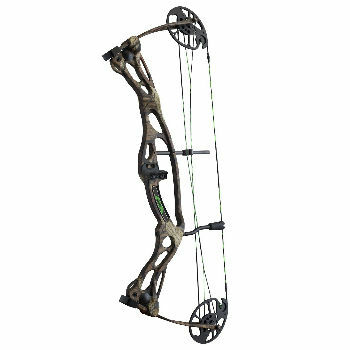 The Diamond Infinite Edge Black Ops is black in color; otherwise it is the same versatile hunting bow. 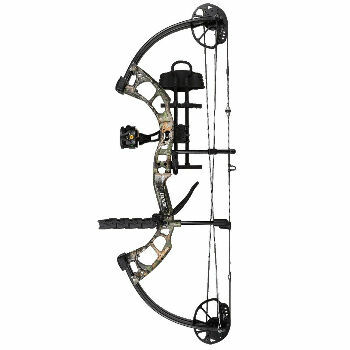 Manufactured by Bear Archery, the Cruzer measures 32” from axle to axle and offers an adjustable draw length ranging from 12” to 30” and adjustable draw weights ranging from 5 pounds to 70 pounds in increments of 5 pounds. It weighs 3.6 pounds and has a 310 FPS. It features a new grip design that gets rid of hand torque to improve accuracy and includes Max-Preload Quad Limbs and offset string suppressors to eliminate vibration and noise. 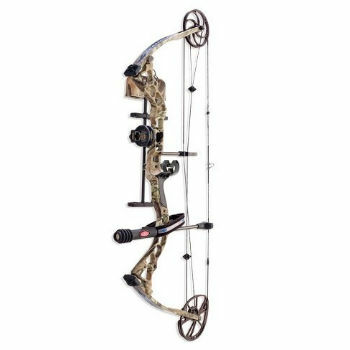 Priced at $399.99, the Bear Archery Cruzer includes a high quality whisker basket arrow rest, a stabilizer, quiver, and wrist strap. Manufactured by PSE, the Brute X has an axle to axle length of 31”, as well as a draw length that ranges from 25” to 30” (comes set at 29”) and a draw weight of either 60 pounds or 70 pounds. (The draw weight is not adjustable.) It weighs 4.5 pounds and a FPS of 312-320. The Vibracheck Backstop acts as a shock and noise suppressor, while the raptor grip teams absorb shock to offer maximum comfort. The Brute X has a new pivoting pocket system and an asymmetric idle wheel that guarantees a smooth feel and performance. The Diamond Core offers a draw length of 25” or 30” and a draw weight that can be adjusted from 40 to 70 pounds. According to the manufacturer, it weighs 3.2 pounds, which seems incredibly light. 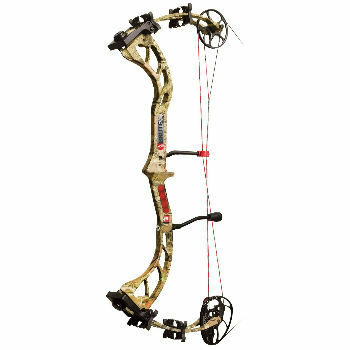 The Diamond Core has been around since 2013, yet users report that it is “an incredible bow, lightweight, very smooth release with highly accurate shots.” According to a user with arthritis, it is a great option because “it is easy to pull back, even if you have bad shoulders.” It has a list price of $698, but it can be found on sale for less than $500 on Amazon. The Martin Threshold has an axle to axle length of 36.75” and is available in three different draw weights (30 to 40 pounds, 40 to 50 pounds, and 60 to 70 pounds) and an adjustable draw length ranging from 25” to 31”. Despite being very lightweight, it has a FPS of 310. On sale for less than $250, the Martin Threshold comes with a Mantis arrow rest, 6 arrow twist lock quiver, and a fiber optic striker sight. According to multiple users the Threshold “gives you the most bang for your buck” and “is highly accurate, powerful, and best of all affordable.” Despite having the lowest listing price of the hunting bows included in this compound hunting bow review, the Martin Threshold offers everything you need for hunting, making it the overall best value on the low cost end. The Apollo Tactical is available in matte black and has an adjustable draw length of 19” to 30”, as well as an adjustable draw weight of 15 pounds to 70 pounds. Depending on what options are installed, it weighs between 4 and 4.8 pounds and has a FPS of up to 320. To ensure a good shot with added stability, it includes a high quality sling that prevents torquing. 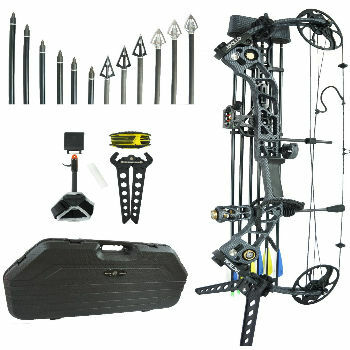 The Apollo Tactical is expensive, but it comes with plenty of accessories, including a hard case, 6 broad head tips, 6 Vanetec aluminum arrows, 6 Vanetec carbon mix arrows, detachable quiver, a hex key set, and wax. Users absolutely rave about how “precise, accurate, and reliable” the Apollo Tactical is for them. No matter what time of year it is, it’s either hunting season now or it’s time to practice for hunting season! So it’s always the right time to purchase your hunting bow. Now, using the reviews above, you can find the one that is best for your needs.